I spent the night of Halloween in the library. Perhaps not exactly where you might expect a witch to be one of the most special times of the year - October 31, or Samhain as many pagans like to call it. 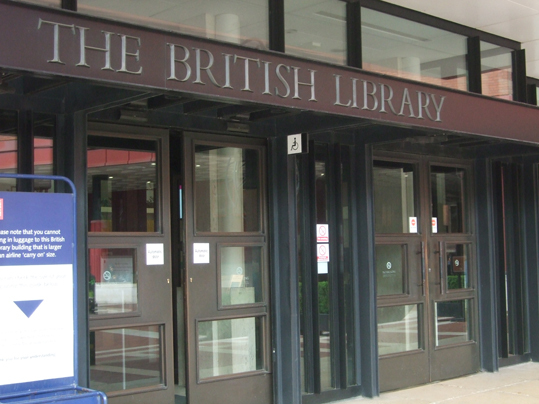 But, it was the British Library and I was there for a very special reason - to hear Simon Costin (pictured left) of the Museum of Witchcraft and Magic talk about Brooms, Wands and Cauldrons: Instruments of Magic. It was an event running alongside the Harry Potter: A History of Magic exhibition that's currently on, which I went to see on the very first day. 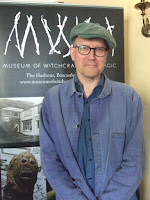 The first half of his talk was actually about the history of the Museum of Witchraft and Magic (MWM), the life of its founder Cecil Williamson, and the origins of some of the items in its collection. Although I did know some if it already - partly from talks at the MWM conference earlier this year and partly from having read the book Cecil Williamson's Book of Witchcraft: A Grimoire of the Museum of Witchcraft - Simon's talk really brought out something of a parallel between the fictional story of Harry Potter's early years and those of Cecil Williamson. Cecil also had a rather unloved early childhood and was sent off to boarding school. While there, he learnt the effectiveness of magic - not because it was a school for witches and wizards, but because the cook taught him to use the witch's swing as a way to deal with a troublesome bully. The cook hung a swing from the branch of a tree and told Cecil to light a small fire of certain dried grasses in front of it, then swing through the smoke while chanting his spell for 20 minutes every day until his wish came true. The bully did not return after the summer holidays, which seemed to Cecil an indication that his spell had worked. Simon went on to explain how Cecil developed a fascination for traditional English folk magic and decided to set up a museum devoted to items related to witchcraft. He regarded the museum as something of a spider's web, attracting magical things towards it - including, naturally, brooms, wands and cauldrons. Wands, I learnt at the talk, are possibly the most ancient of magical tools. After all, you really only need to pick up a stick to use as a wand. Simon agreed that the way wands are depicted in the Harry Potter books is pretty accurate - they act as an extension of your arm and help you direct magical energy and focus your intent. In Ancient Egypt wands were used to draw circles of protection around newborn babies and were also buried in tombs to help protect people in the afterlife. There are even pictures showing Christ using a wand. 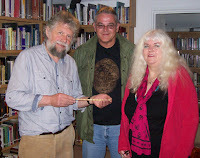 The picture to the left shows Aleister Crowley's wand being handed over to the previous owner of the MWM, Graham King. (The picture is from my own collection, sent to me by the wand donor, Pat). Cauldrons are also pretty ancient. 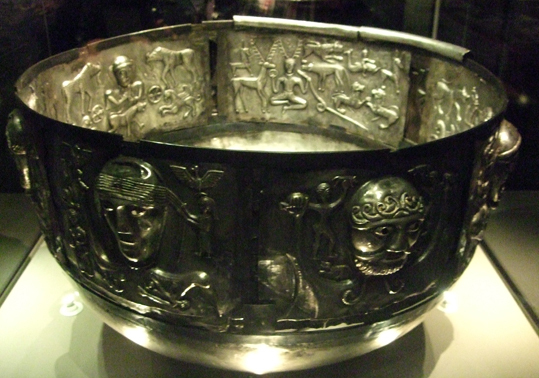 Simon described the Gundestrup Cauldron (pictured right) as the "mother of all cauldrons". It is a highly significant and beautiful artifact symbolising fertility and rebirth. Of course, cauldrons are also cooking pots so would have been common items in the homes of traditional witches, as would brooms. The fact that both brooms and cauldrons are essentially domestic items is probably why they are more associated with female witches or cunning folk than with ceremonial magicians or male practitioners. Also, if a witch hunter was looking to try someone for witchcraft, having an ordinary broom and an ordinary cauldron could hardly be used as evidence of maleficium. Simon explained that nowadays broomsticks are often used in pagan weddings, or handfastings, as the newlywed couple are expected to jump over the broom as a symbol of their fresh start together. On sale at the event was the book Of Shadows - One Hundred Objects from the Museum of Witchcraft and Magic, which shows selection of the items from the MWM, beautifully photographed by Sarah Hannant. You can view Cecil Williamsons Book of Witchcraft: A Grimoire of the Museum of Witchcraft on Amazon and also view Of Shadows - One Hundred Objects from the Museum of Witchcraft and Magic on Amazon.